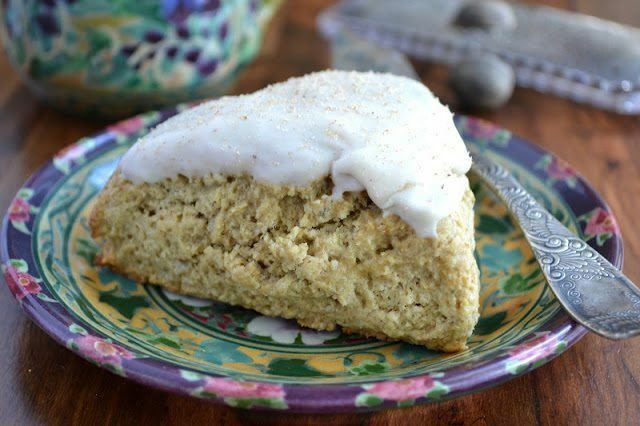 Chai Latte Scones ~ chai is a spiced milk tea from India that's made with the most wonderful mix of warm spices ~ and I've baked them right into these buttery scones for a unique breakfast or tea time treat. Put the dry ingredients (with the exception of the espresso powder) into the bowl of a food processor and pulse till combined. Beat the egg in a liquid cup measure. Add buttermilk till it reaches the 1 cup mark. Dissolve the espresso powder into the liquid and set aside. Add the butter to the food process and pulse until dispersed and crumbly. While pulsing, slowly pour in the buttermilk mixture, adding just enough for the dough to come together. You may not need the whole amount, I didn't quite. Turn the dough out onto a floured surface and pat into a 6" round, adding a little flour if it's too sticky. Cut the dough into 6 or 8 sections and place on a lined baking sheet. At this point I like to slip the pan into the freezer for about 10-15 minutes to re-chill the butter, but this is optional. Bake for 15 - 18 minutes, depending on your oven and how many you've cut. They should be risen, lightly browned and firm on top. Don't overcook them, they don't take long. For the glaze, Combine the sugar, spice and extract and add just enough milk or cream to create a glaze. You can turn the scones upside down and dip them right into the glaze, spread it on with a knife, or drizzle it. Dust the finished scone with a little nutmeg or with whatever spice you've chosen to flavor your glaze.